Roster Recap: The End of Sandy Leon’s Tale? Sandy Leon owes us nothing. He came to Boston as a career .189/.280/.253 hitter. Over a span of 107 plate appearances with the Nationals, Leon struck out 30 percent of the time – piling up around three strikeouts for every walk he took. His offensive production was about half of what was considered league average. At the time, he couldn’t even cut it as a backup catcher in the NL. Since being traded and benefiting from injuries to Blake Swihart and Ryan Hanigan, Leon has hit .251/.312/.375. Never has below-average production seemed so…encouraging? Acceptable? 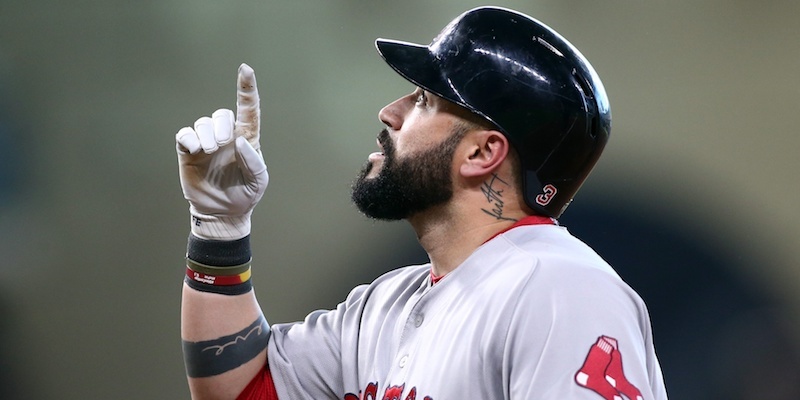 Three years ago, if you had told me that Sandy Leon would have taken the starting catcher role from Blake Swihart and Christian Vasquez, I’d say ha ha who cares the Red Sox just cornered the hitting market by signing Pablo Sandoval and Hanley Ramirez, Ben Cherington forever. Leon exceeded (modest) expectations, and while he was never going to repeat his .310/.369/.476 stat line from 2016, he followed up his 2016 campaign with a season that looked more like what we should come to expect from Leon. It’s hard to package a year in which he took a significant step back offensively along with losing his starting spot as a positive thing, but there are some encouraging signs that Leon can continue to be productive in a specific role for the 2018 Red Sox. Leon made something of a name for himself during his Red Sox tenure thanks to surprising flashes of competent hitting, but he was actually an excellent defensive catcher last year. His 5.5 Adjusted Fielding Runs Above Replacement (Adjusted FRAA) was good for 13th best in all of baseball. It was an eight-run improvement from his 2016 Adjusted FRAA (-3.3). Most of his catching stats improved from last year, and you can look check them all out right here. He improved his framing and blocking significantly, and set a career high in runners thrown out (18). After posting a DRS of 3 in 600 innings over the 2016 season, Leon doubled that number last year, posting a DRS of 7 in only 100 more innings. Leon outperformed Christian Vasquez behind the plate in 2017, although whether that’s more of an indictment of Vasquez than an endorsement of Leon is worth wondering. Leon went back to looking mortal at the plate. Like I mentioned at the top, his slashline dropped from .310/.369/.476 to .225/.290/.354. His wOBA plummeted almost 100 points and he lost 200 points on his OPS this season. He went back to being a significantly below-average offensive catcher, especially in the second half. After hitting .244/.291/.381 with a 72 wRC+ (which is by no means impressive, but tolerable when coupled with good defense) in the first half, Leon only hit .198/.289/.315 with a 60 wRC+ during the second half. During that same time, Christian Vasquez blossomed into one of the better hitters on the team, hitting .314/.359/.453 with a 115 wRC+ over 17o PAs. While the starting catcher battle figures to take place during Spring Training, it certainly felt like Vasquez finally took the reigns as the team’s catcher of the future during that stretch. If there’s any silver linings for the Leon enthusiasts among you, it’s that many of the attributes that led to Leon’s career-best season in 2016 were still in his underwhelming 2017. Leon benefited from incredible amounts of luck in ’16, posting a .392 BABIP. That number dropped 100 points in 2017, and while a .280 BABIP looks more realistic for Leon, the catcher’s numbers look eerily similar across both seasons. He’s striking out and walking at the exact same rate. There were some signs of increasingly weaker contact, but overall, his batted ball numbers stayed relatively unchanged. His rate of contact stayed consistent, and he didn’t chase more pitches out of the zone. Put simply, the regression everyone and their mothers saw coming came. Leon is a backup catcher. He’s not exceptional behind the plate, but he’s not unreliable either. He’s not much of a hitter, but he can hold his own at the bottom of the order. At this point, Christian Vasquez (or Blake Swihart? Anyone? Anyone?) should be the starting catcher, with Leon acting as the backup/Chris Sale’s personal backstop. His contract was tendered at the beginning of December, so it stands to reason that Leon will be back with the team this year. I don’t know if Christian Vasquez is a starting catcher, but I do know that Leon is a backup catcher, and for the short term, that works just fine for the Red Sox.